This is even more puzzling as by 1983 we had evidence that interferon was able to suppress CD4 lymphocyte proliferation. 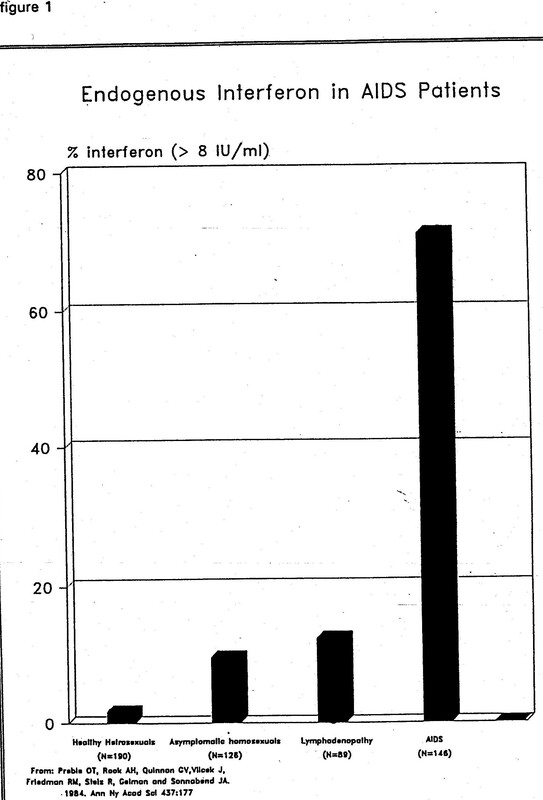 Long before this we knew that treatment with interferon was associated with a low white blood cell count. But if interferon was of no use against HIV it has been spectacularly successful against Hepatitis C, curing many people of this infection. It also may have a place in treating some people whose Kaposi’s sarcoma is unresponsive to antiretroviral drugs, possibly through its ability to inhibit angiogenesis, which is the process of new blood vessel formation. I immediately called Jan who confirmed that Alvin was treating a number of gay men with Kaposi’s sarcoma. Jan very kindly allowed me to work in his lab. I then arranged my time so that I worked in the virology lab in the mornings and saw my patients in the afternoons. 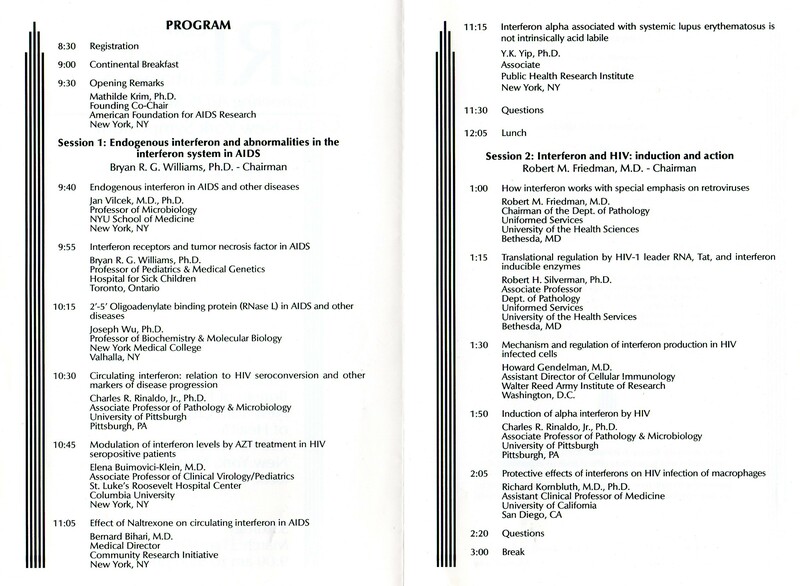 Robert Friedman is a colleague from the early days of interferon research, with whom I had published work on the mechanism of interferon’s antiviral action. He was – and still is, chairman of the pathology department at the Uniformed Services University of the Health Sciences in Bethesda. He, Jan and I have been colleagues since the 1960s when Alick Isaacs, a discoverer of interferon was still alive. We joined forces to study the association of interferon with AIDS. In the first few years of the epidemic I was in a position to begin to explore the possibility that interferon played a role in this newly recognized disease. The numbers of patients was not huge but the following graphic shows that 7 people with over 50 units of interferon/ml had fewer than 50 CD4s, 12 people with 10-49 units had fewer than 500 CD4s while 17 people without interferon had about 700. Several other features recognized among our first patients could also have been effects of interferon. Elevated serum triglyceride levels were characteristically seen. We routinely centrifuged blood before sending the samples to the lab and the turbidity of our patient’s sera was striking. Interferon inhibits an enzyme, lipoprotein lipase that could have contributed to elevated triglyceride levels (TNF can have the same effect), HDL cholesterol was characteristically low which could also be an interferon effect. 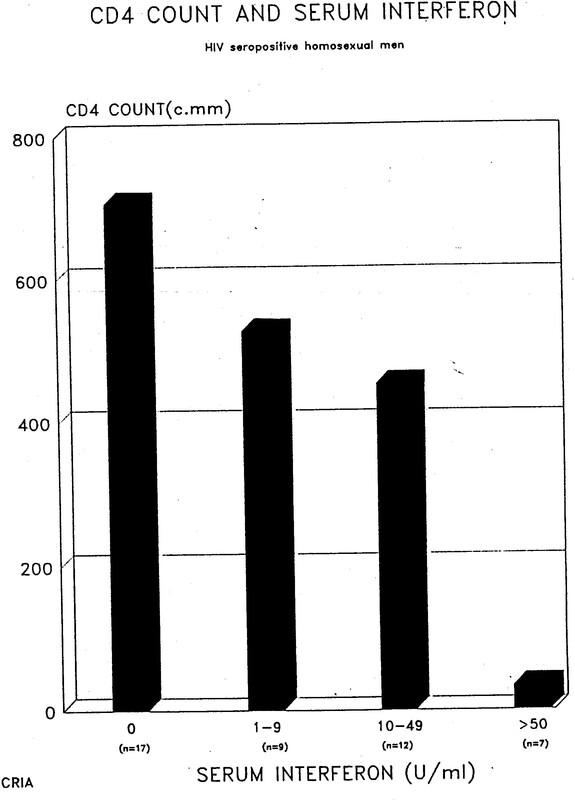 Patients were noted to have low blood tryptophan levels, and even in 1981 we knew that gamma interferon, and to a lesser extent alpha interferon could induce an enzyme (indoleamine 2,3 dioxygenase – IDO) that degrades tryptophan. This was known to be the basis of interferon’s inhibitory effect on toxoplasma gondii, an effect recognized in the 1970s. It’s also possible that tryptophan degradation may contribute to neurocognitive disorders and more recently IDO has been implicated in the suppression of CD4 proliferation. The ability of interferon to inhibit CD4 proliferation was first reported in 1983 – at least 25 years before the effect of IDO was noted. The early zeal to use interferon as a treatment for HIV disease also created a very strange situation concerning a molecule called beta-2 microglobulin (beta 2M). It was well known that alpha interferon is the major stimulus for the synthesis and release of beta 2M, a component of the HLA system referred to above. In the early years of the epidemic various markers were sought that could act as prognostic indicators. It was soon found that a raised beta 2M level in the serum of patients was an adverse prognostic indicator. High levels were indicative of a poor prognosis. 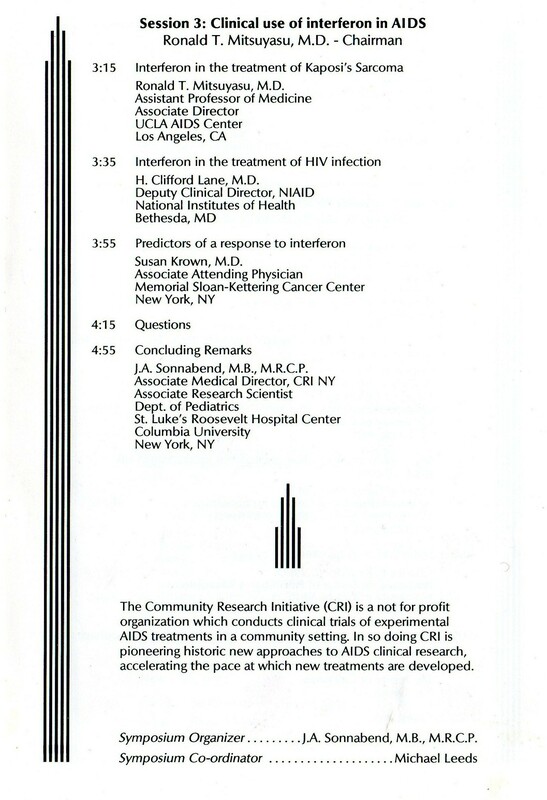 But it appeared that many AIDS researchers were either unaware of this association or remained silent about it. At a meeting I attended on prognostic indicators there was a presentation on beta 2M, but as expected the word interferon was not mentioned. I made a comment that this omission was strange considering patients with elevated beta 2M also had elevated interferon levels. The researcher leading this session looked puzzled and asked if anyone knew what I was talking about. I was rescued from this embarrassing moment by a reply from the investigator that interferon assays, unlike tests for beta 2M, were expensive. One might have expected some discussion but none followed. At this time interferon was being injected into people who already were producing large amounts of it. Beta 2M levels were therefore raised, so the investigators reporting that raised beta 2M levels were adverse prognostic indicators were in effect suggesting that the presence of interferon indicated a poor prognosis – something hard to reconcile with injecting more of it. 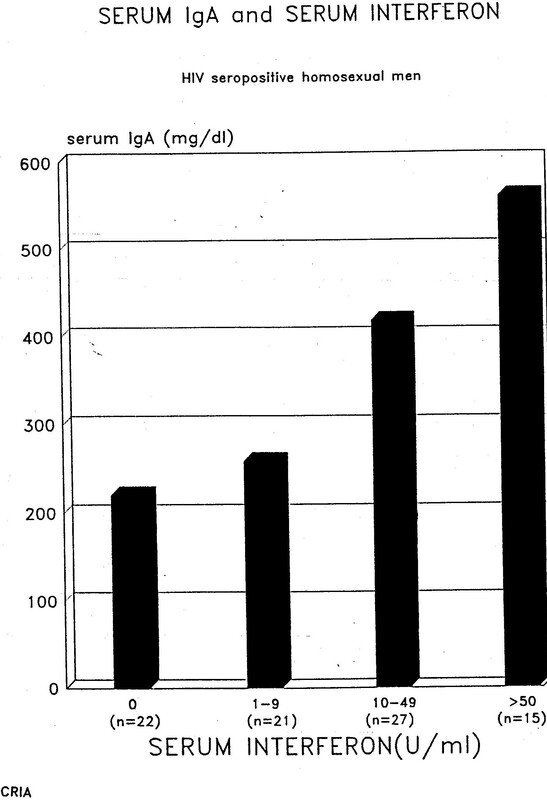 In fact the adverse prognostic significance of serum interferon had already been reported early in the epidemic, as early as 1983, in studies on gay men and people with haemophilia, but neglected as was the case with a good number of early studies. 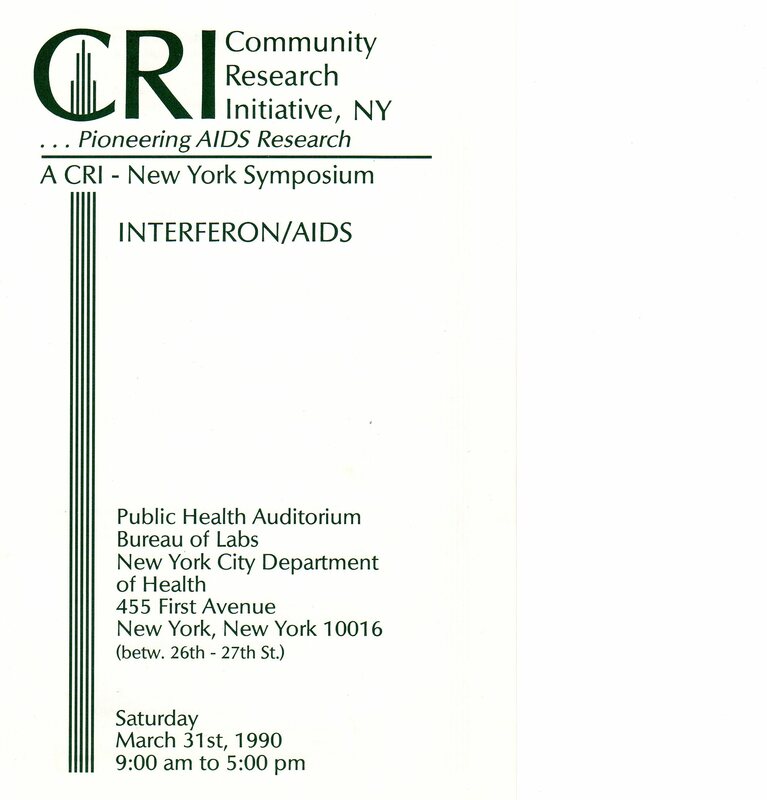 At least one noted AIDS researcher, in 1991 reported studies undertaken to evaluate the “hypothesis” that elevated beta 2M levels were associated with the production of interferon, an association that had been well known for about 20 years! Beta 2M levels can be elevated in certain conditions where interferon is not detectable. But even before the onset of the epidemic we knew that when interferon levels are elevated we expect to see increases in beta 2M. Nonetheless this particular paper was noteworthy in that it discussed this association. Few others papers dealing with beta-2M during those years made any mention of it, thus avoiding the following question. If elevated beta-2M levels indicate an adverse prognosis should we not be concerned about administering interferon when there are already elevated beta 2M levels. This of course doesn’t mean that beta-2M mediated any pathogenic effects, but it simply prompts the question about a role for interferon in pathogenesis. Of course we now know that interferon mediates some of the pathological effects of HIV disease, and beta-2M can properly be regarded as a surrogate marker for interferon. But we knew that AIDS associated interferon was neutralized by monoclonal antibodies against administered interferon, meaning that the molecules were identical, and the interferon in patients’ blood had the antiviral activity expected of alpha interferon when tested in cell cultures. We were able to detect it in patient’s sera in the first place by assays that depended on its antiviral activity. It certainly was responsible for the beta 2M elevations. This justification for administering interferon that cannot stand up to even the most cursory scrutiny was apparently good enough for community writers on AIDS treatment. I repeatedly tried to bring attention to the probable contribution of interferon to pathogenesis without success. For example I received no response to a letter written to a writer on AIDS that can be seen by clicking here. It’s appropriate to emphasize again that interferon has been spectacularly successful in the treatment of Hepatitis C in co-infected individuals, even at lower CD4 counts. AZT treatment was started in these three patients at time 0: HIV p24 antigen and interferon are promptly removed. 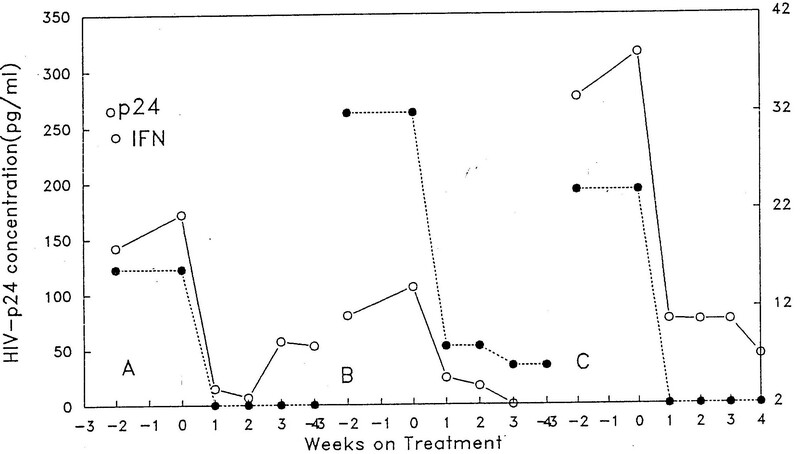 The effect of prolonged treatment with AZT on interferon is shown below. 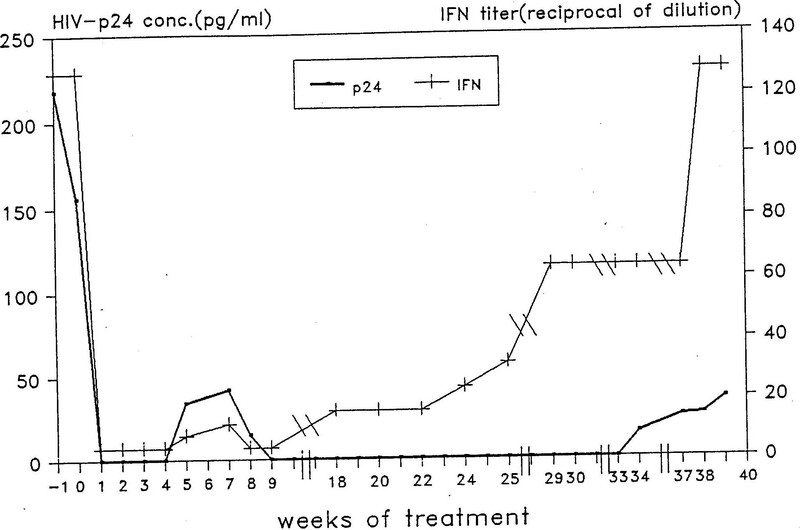 Interestingly, interferon reappeared before HIV p24. Why is the interferon response not turned off in HIV disease? Why does the innate immune response continue to be activated? What are the mechanisms that normally turn off interferon production and why are they not working?